Moldova does not regulate and restrict the use of firearms by law enforcement officials as international law requires. Police use of a firearm is only permissible where necessary to confront an imminent threat of death or serious injury or a grave and proximate threat to life. (1) The State guarantees everybody the right to life, and to physical and mental integrity. (2) No one may be subjected to torture or to cruel, inhuman or degrading punishment or treatment. All meetings, demonstrations, rallies, processions or any other assemblies are free, and they may be organized and take place only peacefully and without the use of weapons. However, under Article 54(1), the exercise of certain rights or freedoms "may be restricted only under the law and only as required in cases such as: the defence of national security, of public order, health or morals, of citizens rights and freedoms....". Paragraph 2 of Article 54, though, stipulates that: "The restrictions enforced must be in proportion to the situation that caused it, and may not affect the existence of that right or liberty." The Constitution does not regulate the use of force by the police or other law enforcement agencies. (1) The activity of the Police shall be carried out exclusively in law enforcement and in the interest of the person, the community and in support of the state institutions for the protection of the fundamental rights and freedoms and human dignity provided for in the Universal Declaration of Human Rights, the European Convention on Human Rights and Fundamental Freedoms, the European Code of Police Ethics and other international instruments, in accordance with the principles of legality, respect for fundamental human rights and freedoms, impartiality and non-discrimination, permanent hierarchical control, personal accountability and professionalism, transparency, respect for secrecy state and other official information with limited accessibility. (2) Police do not apply, encourage or tolerate torture, inhuman or degrading treatment. 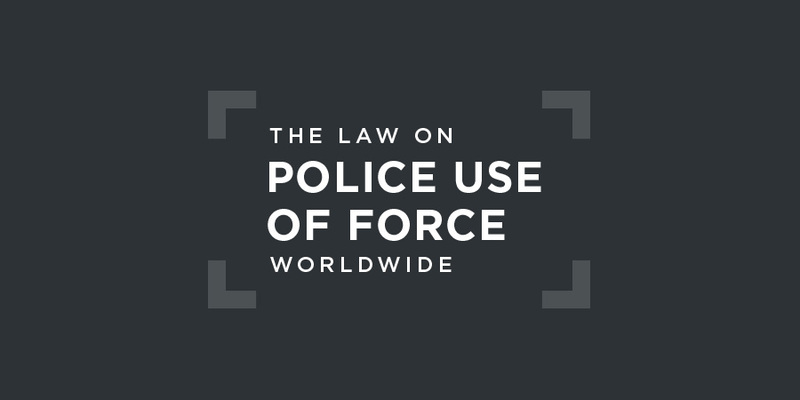 (3) The application of physical force, special means and firearms shall be admitted only in strict accordance with the law and if the non-violent methods do not ensure the fulfillment of the Police's attributions. Under section 17 of the 1990 Police Act, police officers have the right to use firearms as a last resort in self-defence. This is insufficiently detailed. Police use of a firearm is only permissible where necessary to confront an imminent threat of death or serious injury or a grave and proximate threat to life. Accordingly, Moldovan law does not specifically regulate police use of force and firearms as international law requires, including with respect to the principle of proportionality and the duty of precaution in the planning and conduct of law enforcement operations. The deliberate inflicting of severe bodily injury or damage to health which is life-threatening or which causes the loss of sight, hearing, speech or damage to or loss of function of another organ, or mental illness or some other form of damage to health accompanied by the permanent loss of at least one-third of the capacity to work, or which results in a miscarriage or an incurable disfiguration of the face and/or adjacent areas, shall be punishable by imprisonment for three to ten years. at reports that most cases of torture and cruel, inhuman and degrading treatment in the context of criminal investigations are attributed to police officers and law enforcement personnel during the arrest and the preliminary investigation period, and that law enforcement personnel induce violence among inmates in order to punish or elicit cooperation from targeted detainees. guarantee the right to freedom of assembly without any undue restrictions or obstacles in law or in practice, and take appropriate measures to ensure that organizers and participants of assemblies do not face any acts of intimidation, including police interference prior to the organization of assemblies. This case concerned the circumstances surrounding the killing of the applicants’ 29-year-old brother Alexei Vlasi during a police operation on 14 March 2009. At approximately 10.20 p.m. three plain-clothed police officers (N., B. and C.) entered a five-storey apartment block to arrest a person suspected of armed robbery. According to their information, the suspect in question was supposed to be visiting his ex-girlfriend M. that evening, who lived on the fourth floor of the building. At the same time, M. was coming down the stairs from the fourth floor with a group of four friends. None of them was the suspect wanted by the police. Two young women (S. and Z.) and a young man (G.) were at the front of the group and they passed the police officers between the third and second floor. 9. Upon passing the first part of the group one of the police officers immediately apprehended G. Mr Alexei Vlasi and M. were several storeys up and saw the police officers as they approached the rest of the group. Two police officers rushed after Alexei Vlasi, who started to run back up the stairs. They apprehended him on the fifth floor. Shortly afterwards, one of the police officers shot him in the back of the head at very close range. He died instantly. According to the police officers, when Alexei Vlasi ran up the stairs, they thought he was the suspect they had been after. They claimed to have been convinced that the victim was the suspect they were looking for and that they only realised their mistake after he had been shot. However, later, police officer B. admitted he had known Alexei Vlasi for a long time. Police officer B. chased Alexei Vlasi and approached him from behind on the landing of the top, fifth floor. He put his hand on his shoulder, called him by the name of the wanted suspect, announced that he was a police officer and asked him to come with him. At that moment Alexei turned around and punched police officer B. in the face with his right fist and attempted to run down the stairs. When he punched police officer B. he did not have anything in his hand. Police officer B. was pushed into a wall on his right and lost his balance. However, police officer C., who had already approached them from behind, managed to apprehend Alexei Vlasi by pulling his left arm near his shoulder (in his initial statement police officer C. stated that he had apprehended him by the collar of his jacket). The apprehension took place on the top three steps of the flight of stairs leading to the fifth floor. Police officer C. was behind Alexei Vlasi on a higher step, holding his hand with his left hand and holding his pistol pointed upwards in his right hand. At that moment, without changing his position, Alexei Vlasi stabbed police officer C. in the right thigh with a knife, which he had been holding in his right hand in reverse grip. Then, without changing the position of the knife, Alexei Vlasi attempted to turn to his left and to stab police officer C. in the face. According to police officer C., Alexei Vlasi had been standing upright. Fearing for his life, police officer C. pulled the trigger of the pistol he was still holding upwards and shot him in the upper neck. some blatant discrepancies between the version of events relied on by the Government and the evidence in the case file. According to the video reconstruction of the scene of the shooting ... the shooting took place on the upper part of the stairs leading to the fifth floor. However, a report describing the scene immediately after the incident and enclosing relevant pictures does not contain any information about traces of blood which would indicate that the victim’s body had rolled down the stairs to the landing between the fourth and fifth floors. The Court finds it highly implausible that the victim’s body, which had been subjected to a serious gunshot wound to the head, could roll down the stairs without leaving any traces of blood. Indeed, according to that report the victim had lost so much blood that traces of it were found on the storey below, on the landing between the fourth and third floors. ... In the same video reconstruction, police officer C. alleged that at the moment of the shooting, Alexei Vlasi had been standing upright with his head right in front of him on the step below, and that he had been holding his gun at the back of the victim’s head pointed upwards. However, the bullet with which the victim was shot hit the wall at a a significantly lower point than where the victim’s head had allegedly been positioned. Indeed, the ballistics test indicated that in order for the bullet to have hit the wall at the place suggested, the victim must have been bent over.... Had the victim been where police officer C. described, the bullet could not have hit the wall at the place suggested. ... In view of the above fundamental discrepancies, corroborated by the fact that no fingerprints of the victim were found on the knife with which police officer C. was allegedly stabbed and with the statements of witnesses which, unlike those of the police officers, are not inconsistent with the factual evidence in the case file, the Court has serious reservations concerning the credibility of the version of events relied upon by the Government. It follows that they have not proved that the use of deadly force against Alexei Vlasi was necessary in the circumstances of the case and therefore their responsibility is engaged.